"Ingenious improvisation, delicate passion, incisive trumpeting and purity of tone." "He moves with drama and mystery, the trumpet floating atop a solid rhythm section in a demonstration of applied impressionism. Excellent and highly recommended." "Wonderfully eloquent and innovative, aspiring jazz players and aficionados alike would do well to add Into The Mist to their collection." 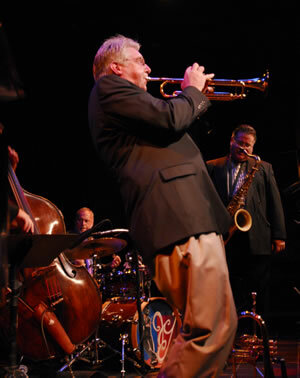 "Forney sorts through his lush lexicon of trumpet tones and statements like a writer immersed in creation, selecting only the most suitably beautiful phrases and inflections. He conjures a line as a poet might, weighing its merits and strengths, then moving on to whichever idea seems the next most appropriate. Conveying comfort and emotion in ways that appeal to the more romantic areas of the mind and heart." "Thanks again for scoring me the ticket to Chorus Line. It was sensational. What can I say, the orchestra sounded great and that was some of the most beautiful lead playing in a Broadway Musical I've ever heard. The volume level was perfect and the intonation was absolutely perfect. Your sound is beautiful man, and you on that NY could be like unleashing something powerful." "I heard a few cuts from your CD and was impressed with your group and with your sincere and unhurried sound. What a pleasure, but not a surprise, as you have always maintained a quality that is old school and downright tastefully refreshing." Forney's writing is quite original while being in the jazz tradition. Matched with the passionate tenor saxophonist Brice Winston, pianist Chuck Marhonic, bassist Dwight Kilian, and drummer Dom Moio, Forney performs seven of his originals. He alternates swingers such as "Nearly Human" and "The Simplest Things" with more brooding works including "The Mystic" and "Meditation No. 1." The result is a forward-looking hard-bop set that swings while being open to unexpected directions. 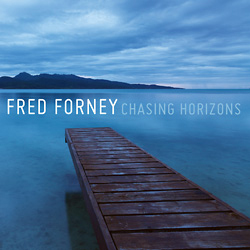 The other musicians have their spots to star but "Chasing Horizons" is very much Fred Forney's project, showcasing his playing and writing talents at their best.